When it comes to web search, the stakes are high for auto dealers. Your dealership spends a lot of time and money building and maintaining its website. But if one of your competitors ranks higher than you in a search and gets the click, that potential customer never even makes it to your site — a lost opportunity. Learn the exact step-by-step scientific methods that can help your dealership crush the national classifieds in organic search every time. 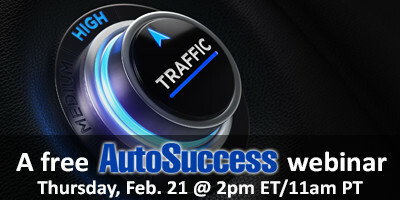 When you attend this free webinar on Thursday, Feb. 21, you’ll gain knowledge to power your site up the rankings. These best practices will be presented in an easy-to-understand and casual format, and questions are encouraged.